As a superintendent or a distributor to golf courses, you know the demand for superior results on every green, tee, and fairway. Progressive Turf was designed just for you! As an athletic field turf professional, park director, or distributor to sports complexes, you know the demand for perfection. Progressive Turf makes it as simple as 1-2-3! Professional turf management is a tough job. But, you also have to maintain flowers, shrubs, and other finicky ornamentals. Progressive Turf gives you phenomenal results and peace of mind! Progressive Turf is a recognized industry leader in plant health technology, manufacturing and distributing “sustainable” specialty liquid plant nutrition products, primarily for turf and ornamental applications. We utilize a unique, proprietary soybean & plant extract technology as the basis for our turf and ornamental nutrition line. Our products are widely acclaimed within the industry for their utility, superior plant response, and ease of use. We offer organically-based, technologically advanced, liquid foliar fertilizers derived largely from renewable sources (and, NO waste streams!). They are designed to improve turfgrass color, density, and roots, without promoting excessive vertical growth. We at Progressive Turf are so convinced of the performance of our Turf Products, that we unconditionally guarantee your complete satisfaction when purchased directly from the company. We simply ask that you apply the product at the recommended application rate for four (4) consecutive weeks. Having done that, if you are not satisfied with the products for any reason we will pick up any unused containers and provide you with a full refund, on your first initial order. Please feel free to contact our office directly for details. How do you know that you can trust Progressive Turf with your turf? Unlike most of our competitors who are “marketing focused” companies, Progressive Turf is a “technical efficacy” focused company. Many of the leading liquid turf fertility companies bought or leased (licensed) their formulas from outside technical experts. At Progressive Turf, the owners are the chemists, agronomists, and formulators for all of the products offered. In addition, many specialty turf nutrition companies don’t even make their own products. They contract the work out to other companies that specialize in turf fertilizer production. Again, I know this because I have been manufacturing specialty turf products for nationally-known brands for 3 decades. 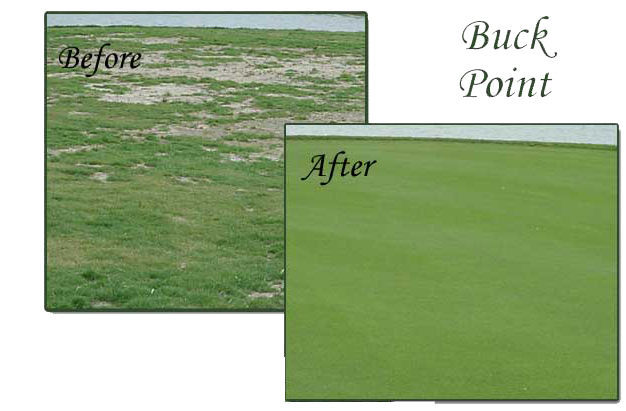 The owner of Progressive Turf has been designing, formulating, and manufacturing specialty liquid turf nutrition products for foliar and soil applications for over 30 years. Leading brands (both nationally and internationally) have frequently come to him to design new products and to improve their existing products. Golf course superintendents, Sports turf managers, and Sod growers have a choice when it comes purchasing specialty liquid turf fertility products. You can buy from the companies that have always focused on marketing their products, or you can buy from the one the other companies turn to for creating and improving their products. When you call Progressive Turf for answers, you won’t speak to someone reading bullet points off of a tech sheet someone else wrote. You’ll talk to someone who actually understands your problems, and who knows all of the products available from the inside out. You’ll get real answers, from real experts, for real results! Call now to find out how you can use Progressive Turf to get PGA quality results! Progressive Turf is a +16 year industry leader in plant fertility technology, including advanced research with liquid turf applications on PGA courses, and studies done by multiple universities including University of Florida, Clemson University, Michigan State University, and others. Progressive Turf manufactures and distributes specialty plant fertility and nutritional products primarily for premium turf care applications such as golf course greens and tees, as well as professional sports turf and ornamental maintenance.